The Shedd Aquarium offers an example of an unusual microgrid in development, one that contributes to a sustainable environment for more than 1,500 species, including fish, marine mammals, birds, snakes, amphibians and insects. 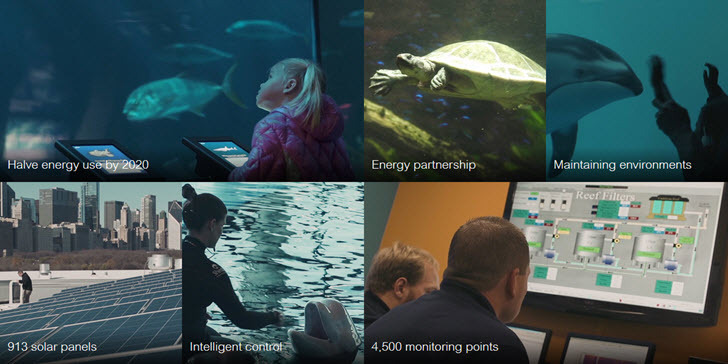 With a sophisticated energy management and building automation system managed by Schneider Electric and other technology providers, Shedd keeps animals, visitors and staff comfortable – while saving energy. The 471,396-square-foot building is well on its way to achieving its energy savings goals even though it must run 24/7, 364 days per year. On top of that half the building was constructed over a century ago. Advancing on the path toward full microgrid integration, the Shedd Aquarium offers an opportunity to see step-by-step development of a remarkable energy system that is clean, resilient and highly efficient.